What vote will deliver the change we need...? This has probably been the most dramatic election campaign that I have experienced in almost 40 years of voting. As with most elections, the media focusses on the drama rather than the substance and there is very little real analysis of the policies and what would really be in the best interests of our country. After nine years in power National has created an opportunist, boom and bust economy that has served property investors, banks, corporate interests and intensive dairying well. At the same time we have seen damaging under-investments in social welfare, housing, education and health. The lowest income quintile of New Zealanders have suffered most and we now have the highest percentage in the developed world of homelessness and the worst statistics for child health and welfare. Our environment has suffered hugely and we have one of the weakest responses in the world to climate change. 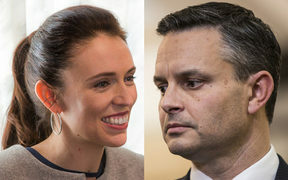 To hold on to power National has resorted to wild scaremongering as it has seen its comfortable lead melt away with the warm positivity of the Jacinda effect. The claim that there is a $11.5 billion hole in Labour's proposals and that cabbages will cost $18 each is the equivalent of Muldoon's dancing cossacks. Sadly such blatant lies can be effective when the initial headline gets the most attention and the rebuttal or retraction generally becomes minor news. The constant attack on Labour's tax plans has also created a perception of uncertainty and yet the media has not looked in any depth at National's campaign promises and the cost benefit analysis behind them. One of their most expensive policies is the $10.5 billion promised for even more roads when the whole country is screaming out for improved public transport systems and a greater investment in rail. Voters need to understand that the National Government is a reactionary, populist and largely neoliberal one that rarely uses evidence to support major decisions or has a future focus. Its attempts to deal with the housing crisis is the most obvious indicator of its ineffectiveness. It knew in 2008 that there were issues around housing supply and affordability and yet chose to protect the interest of property investors above ordinary New Zealanders. That decision ultimately caused us to have the most expensive housing in the world and ignored the fact that having decent housing actually underpins the general health and wellbeing of our communities. It is also false economics as our health system struggles to meet the growing numbers of patients suffering from respiratory illnesses and Rheumatic Fever, directly attributable to poor housing. While National is now throwing some money at areas of need, we need to question why they didn't act earlier and why the amounts involved are still very minimal compared to what is actually needed (and a fraction of what they are prepared to spend on roads). When the likes of mental health needs a huge investment to turn around our shocking youth suicide statistics it appears to be more important to cater for those who want to drive their cars (National supporters clearly have a strong aversion to slumming it on buses). Earlier this year Metiria Turei suggested that there should be a unit within Treasury to independently cost party promises each election, but it was National that was most reluctant to support this. Only Labour and the Greens have sought independent analysis of their policy costings. When the current Deputy Prime Minister suggested that some people should have fewer human rights it was a clear indication that the current judgemental and punitive approach that is being used to manage social welfare support won't change if National is re-elected. Bill English has already written off our struggling young people in favour of continuing to rely on cheap migrant labour. Compassion is a word that may be used by National MPs at times but its true meaning is beyond their understanding. A good deal of the legislation passed under this Government breaches the human rights declarations we have committed to, and this isn't likely to change in the future. The Labour Party and the Green Party are the only two parties who have publicly committed to changing the government and declared an interest in forming a coalition afterwards. It is also important that voters think carefully about the sort of values and governance that they would like to have emanating from the beehive. Surely the corruption and conflicts of interest that have been the hallmark of the National led Government needs to end. Report after report and numerous court decisions have questioned government decisions and internationally our past reputation as a clean green, honest paradise is rapidly eroding. Labour has built some real momentum after Jacinda took on the leadership. She has proven to be knowledgeable, empathetic, quick witted and personable and has won the popular vote from the leadership debates so far. Behind Jacinda are team of current and potential MPs who would be easily more competent and principled than National's line up. However Labour is still a mainstream party that has over 80% of its donors as secret and neoliberal, corporate concerns may still have an influence on decisions over ordinary New Zealanders. When Jacinda was elected leader and Labour rose in the polls a flurry of donations came in, many would be wanting to buy influence if the party became the government. The Green Party has been open about all major donors. While Labour has adopted a number of Green like policies in relation to addressing our polluted rivers, climate change and addressing poverty, many still don't go far enough. In a Newshub debate between Labour's Carmel Sepuloni and the current Social Development Minister Anne Tolley, Sepuloni refused to count out the use of sanctions for beneficiaries and commentators were concerned about the softness of Labour's policy in this area. The Green Party are the obvious coalition partner for Labour and will add real value for supporting true progressive change. The Green's comprehensive policies on climate change, protecting our freshwater systems and dealing with poverty would strengthen and compliment Labour's policies if a good many are adopted. The Green Party's history of getting greater transparency in parliament and government will also be of value (we only have access to MPs expense claims because of the Greens). The Green Party would be a useful conscience for a Labour led government that still has the remnants of its neoliberal past lurking in its back benches. The greater the Green vote, the greater chance Green policies and transparent decision making will feature. TOP is unlikely to pass the 5% threshold so is a wasted vote, Winston is a populist and almost Trump like in his approach to politics and he has spent most of his recent campaigning on his own personal issues. Act and United Future are also nonentities and barely exist as functional parties. The Green Party is not a minor party as the media have often suggested after it dropped in recent polls. For the last six years the Greens have sat above 10% and, before the arrival of Jacinda, one poll gave the party 15% (only 9 points behind Labour at the time). For the last few years the party has managed to raise more money than Labour and built a sizeable membership. The Green Party also has an impressive candidate list with many highly competent and principled candidates who would be great in government. A party vote for the Green Party is not a wasted vote. It is a vote to change the government, it is a vote for our rivers, for our climate and for our struggling families. The Green's policies on most issues from health to education, to sustainable business and our precious environment are also evidence based and comprehensive. It is also a vote for an able coalition partner for Labour to ensure the real change we need actually happens.